Minerals Industry Technology to help you extract more value. A-Ward has a proven track record with global mining companies – delivering robust, business-driven, intelligent solutions. 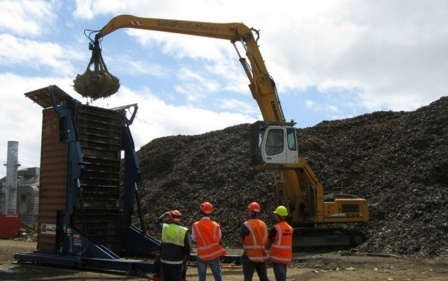 Our equipment will help you extract maximum value when handling any type of mineral. 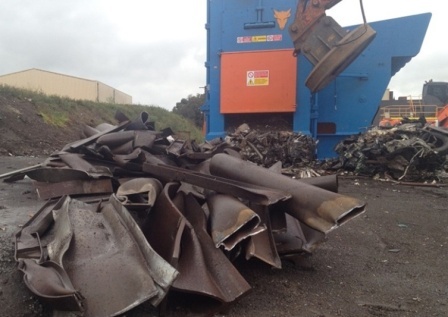 We tailor the final solution to suit the exact mineral – from low-value mass movement product, through to high- value or toxic materials requiring sophisticated handling. A-Ward will customize any of our products to suit your specific needs. Talk to us about creating a turnkey solution designed specifically for your plant – creating business-wide efficiencies for all your loading/unloading requirements. 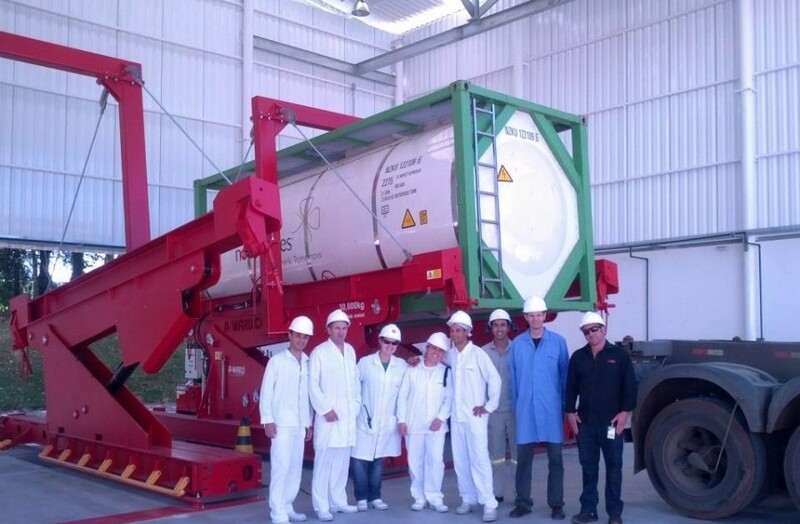 >Maximizes your transportable weight per container, loading more materials than competitors. >Full control over loading/unloading speeds with adjustable angles (including side-rotating option). 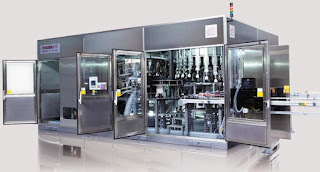 >Can be customized to integrate with your plant (e.g interface with your PLC system). >Prevents moisture and contamination with our purpose-built container liners. 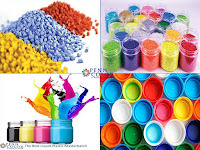 >Protects particle structure and reduce dust with quick direct material loading. >Avoids double-handling (by weighing the container during loading). >Engineered stronger to meet large-scale processing requirements. >Reduces manpower required, and is easily managed by a single operator. Coal producers are able to maximize all container weights when loading coal into tilted-up shipping containers. By using an A-Ward container loader, coal exporters are also able to load containers extremely quickly and minimize labor costs involved with the process by using a single operator. The digital scale also enables the operators to know exactly how much weight is in each container at any time during the loading process to ensure that the maximum loads are achieved every time. 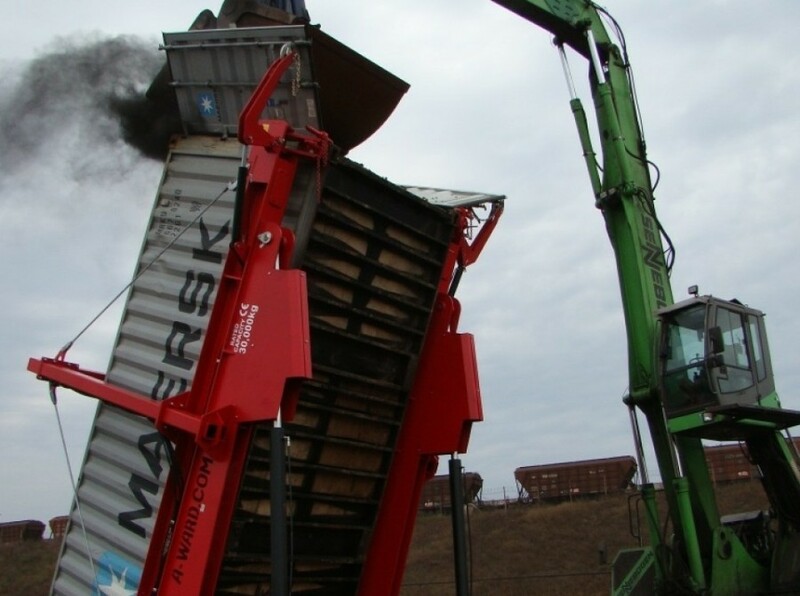 Coal buyers are able to unload shipping containers extremely quickly with a single operator, minimizing labor costs, when using an A-Ward container tilter. 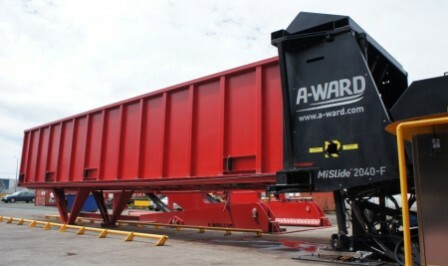 Nickel product producers are able to weigh shipping containers during the loading process to ensure maximum allowable shipping weights are achieved with every load when using an A-Ward container loader. When loading nickel products into tilted-up shipping containers, the entire volume of the shipping container is able to be utilized and the digital scale enables operators to know exactly how much weight is in every container during the loading process. 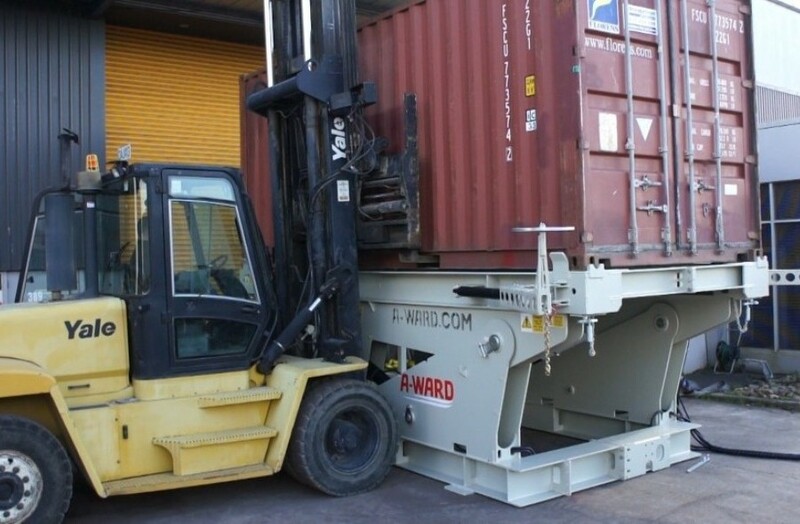 A-Ward container unloaders enable nickel product buyers immediate and controlled unloading of their shipping containers and remove the reliance on expensive and scarce tilting trailers. 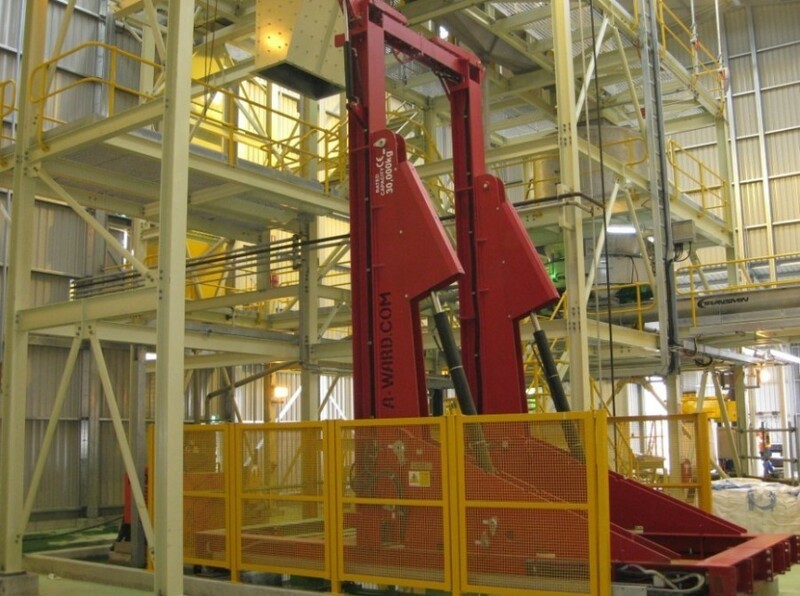 Hydraulic door opening arms also ensure maximum operator safety. Mining companies are able to eliminate all safety risks when unloading steel balls into ball mills using A-Ward container unloaders. 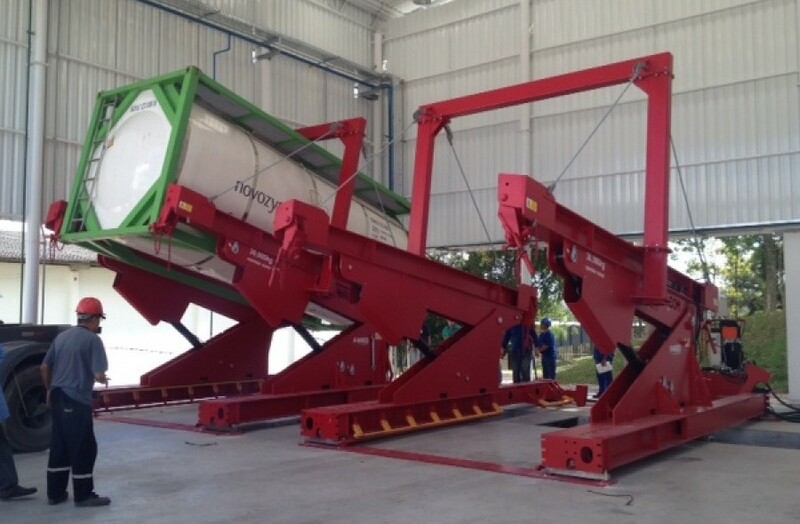 By integrating A-Ward’s container unloaders with ball mill systems, the entire ball unloading and milling process becomes a totally enclosed, hands free and safe operation. 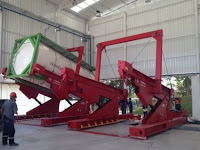 The container tilter controls are also able to be integrated into the company’s PLC system to enable full automation. 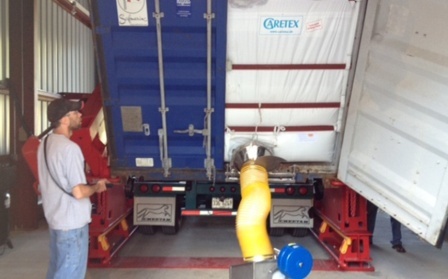 Lime producers maximize all container weights when loading lime into tilted-up shipping containers. By using an A-Ward container loader, lime exporters are also able to load containers extremely quickly and minimize labor costs involved with the process using a single operator. The digital scale also enables the operators to know exactly how much weight is in each container at any time during the loading process to ensure that the maximum loads are achieved every time. Lime buyers are able to unload shipping containers extremely quickly with a single operator, minimizing labor costs, when using an A-Ward container tilter.